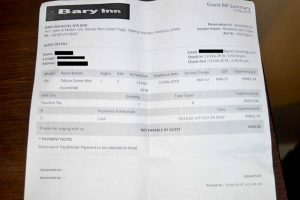 Within it’s price category, this hotel deserves a better star rating review than what you find online. 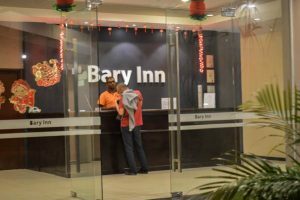 The Bary Inn hotel Kuala Lumpur with airport shuttle, free parking, wifi and restaurant is simple but enough. We wanted a room close to the airport due to a long day of travel, with shuttle, wifi and cheap, for one night. 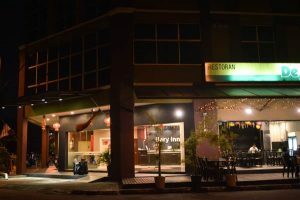 The Bary Inn, located a short 20 minutes away at No 1 Jalan 4, Bandar Baru Salak Tinggi Business Park, Bandar Baru Salak Tinggi, 43900 Sepang, Selangor, Malaysia seemed like a perfect choice. Shuttle service included? Yes, but… We phoned the hotel at 4:50 pm to let them know we had arrived and they said the shuttle would arrive at 5:30, level 1, exit 3. We found the area by 5 pm and sat to wait. At 5:25 we called to reconfirm and they told us to call the driver. So we took the phone number and called the driver who said he would come at 6:30 pm. We called the hotel again and they said there was nothing they could do. We were tired from travelling and upset that we had to wait – not off to a good start. More about the shuttle further down. Rather than waiting we ordered a Grab which finally arrived at 6:10 pm – on a different level, but ok. Cost 65 ringgit / €13.50 / USD$15.50. The drive to the hotel took around 25 minutes. Check In was painless. Reception was friendly, reserved, maybe a little confused. He was not apologetic for the shuttle problem, rather wanted to get us to reserve it for the next day, I assume to avoid any further complications. The Room: Not the Ritz, but value for dollar it definitely is. Clean, walls not too scuffed and a firm double bed with clean bedding. 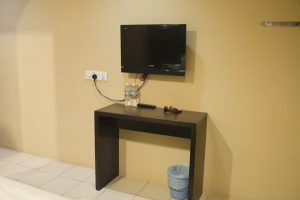 End tables, a desk with no chair, small tv, ceiling fan and air conditioning complete the small room with a highway window view. Yes, you can hear the traffic whizzing by, but it is muffled and I read there are rooms without windows, so traffic is not so bad. Lots of hooks to hang clothes is a thoughtful addition. Unfortunately, although there are international plugins / receptacles there is only one and none are by the bed, but there is a light switch. 2 courtesy bottles of water are included as is WiFi. The Bathroom, is a simple bathroom with sink, toilet, and shower. Surprisingly, 2 single use shampoo packets and 2 small soap bars were available! The shuttle worked great in the morning. Look for a white van with green Bary Inn on the left door and green Bas Persaran on the side. Would I stay here again? 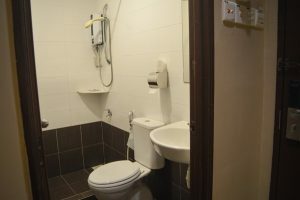 Yes, it is perfectly located with only 20 minutes to the airport, clean and the price is amazing. Next time, I would make it very clear when our arrival is so there would be no complications with the shuttle. The place was very busy with locals and travellers alike.